Two brush fires burning in the Angeles National Forest in Southern California has prompted evacuations of nearby neighborhoods on Monday. AZUSA, Calif. -- Two brush fires erupted in the Angeles National Forest, north of Azusa and Duarte, amid record-breaking temperatures Monday. The California Highway Patrol received a call at 10:57 a.m. that a pickup truck went over the embankment on Highway 39 near the Morris Reservoir dam, and that the truck was catching fire. Firefighters from the U.S. Forest Service and the Los Angeles County Fire Department were dispatched to the scene. The blaze, dubbed the Reservoir Fire, has now spread to 1,200 acres. The driver involved in the accident was declared dead, according to the Los Angeles County Fire Department. A second fire, called the Fish Fire, erupted nearby in the Duarte area about 90 minutes later. That fire has burned approximately 1,000 acres. 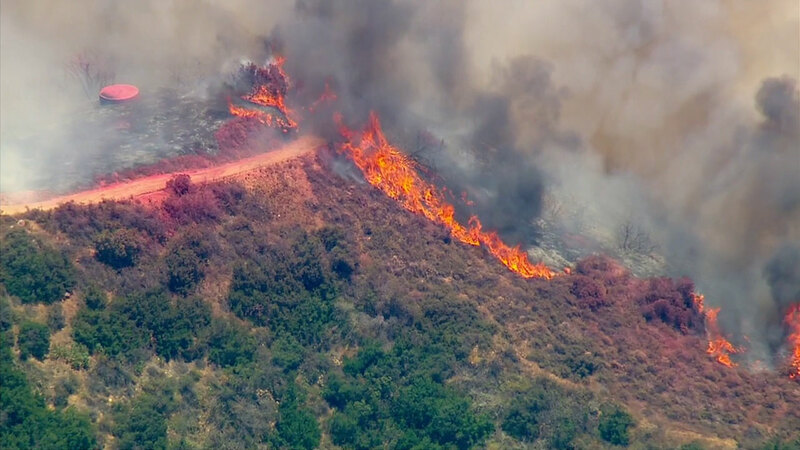 Azusa police have ordered evacuations for Mountain Cove, Rainbow Canyon Ranch and El Encanto. An evacuation center has been set up at Duarte Community Center, 1600 Huntington Dr., and at Memorial Park, 320 N. Orange Ave.
For the city of Duarte, an evacuation order has been issued for homes north of Fish Canyon between Encanto Parkway and Greenbank Avenue, Brookridge Road and Opal Canyon Road. An evacuation center has been set up at Duarte City Hall/Senior Center, 1610 Huntington Drive. Large animals can be taken to the Pomona Fairplex grounds, and small pets can be taken to Wonder Dog Ranch at 220 Taylor St. in Monrovia. Smoke from the forest fires was seen by residents across the Southland, including West Covina, Alhambra and Brea. ABC7's Phillip Palmer said he could see the fires from Industry Hills. The South Coast Air Quality Management District issued a smoke advisory due to the fires. AQMD officials said air quality could reach unhealthy levels in areas impacted by smoke, including portions of the East San Gabriel Valley, the Pomona/Walnut Valley, the San Gabriel Mountains and metropolitan Riverside. Officials are urging the public to exercise caution and avoid unnecessary outdoor activities in any area directly impacted by smoke.